LACCENTO MONTALBERA - RUCHÉ CASTAGNOLE MONFERRATO D.O.C.G. Nothing is easier than falling in love with Ruché, with its delicate colour, intriguing aromas and smooth elegant mouth feel with world-class taste. It is truly challenging to successfully describe its distinctive and unique characteristics. However, it can be done. This is how the challenge named LACCENTO was born. By attentively and scrupulously analysing the Estate’s production and the positioning of the best vines, working with modern masterful oenological techniques, and following the best practices of vineyard management, a shrewd dispersion of the grapes during the early summer, wise selection of slightly overripe grapes, with a "small” blend of grapes dried on mats in thermo-sterilized rooms for 40-55 days, depending on the vintage: this gave birth to a wine with remarkable supplesse and elegance. An important wine, persuasive and long-lasting with delicate fragrances - it represents “the other face of Piedmont”. LACCENTO selection signed Brico Montalbera, with extraordinary southern exposure at an attitude of approximately 280 m above sea level. 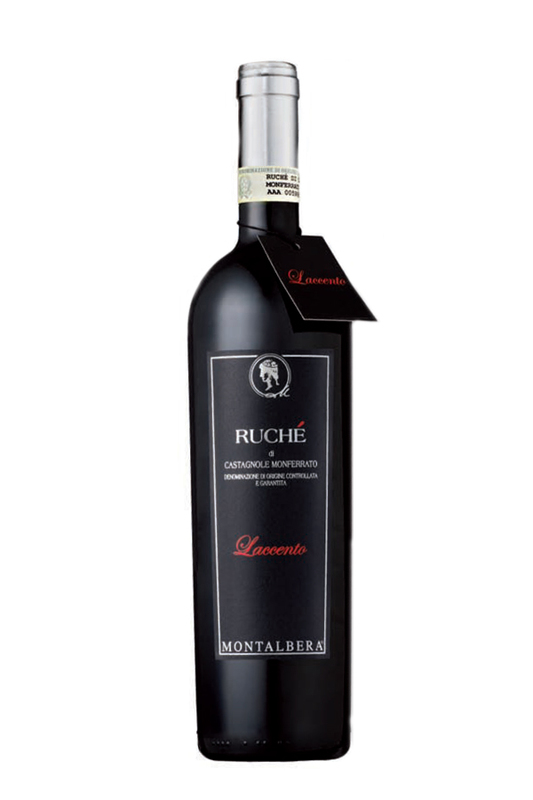 ...and then: Ruché di Castagnole Monferrato LACCENTO: a wine of sublime originality. The sheer quantity of flowers and fruit in the bouquet derives from one of the finest and most intense grapes that, so majestically luxuriant and luscious, can be harvestd and processed today. Yet harvested with such respect and absolute lucidity that their lively, chlorophyllic breath is ratained immaculately in this wine. Chapeau, is a wine that once encountered can never be forgotten, one enjoyed is yet admirably appreciated. Area of production: Bricco Montalbera Castagnole Monferrato, Piedmont. Vine training system: low trained Guyot system with 7-8 buds on the fruiting cane. Grape variety: Ruché of Castagnole Monferrato. Old vines more than 25 years. Grape harvest: part in overripe directly in the vineyard (about 95% of the production) and part (about 5%)ahead of optimum ripeness and placed on wood trellises room thermo-conditioned and sterilized. Vinification: for the part collected in over-ripen: traditional red method, cold preseeping during first few days and brief warm post-seeping after fermentation. Total duration in contact with the marc is 12-14 days. Ageing: least 6 months in bottle placed horizontally at a temperature not exceeding 10 degrees for the important presence of sugar. Longevity 6-8 years. Colour: intense ruby red with slight purple reflections in youth, turning garnet after the first few years in the bottle. Nose: intense, extended, slightly aromatic and fruity with aromas typical of wild berries, jam. Palate: warm on the palate, pleasant, rare silkiness.